While the optimal transport problem, in its original formulation, is a static problem (no time evolution is considered), it makes sense in many applications to rather consider time evolution. This is relevant for instance in applications to fluid dynamics or in medical images to perform registration of organs and model tumor growth. In this perspective, the optimal transport in Euclidean space corresponds to an evolution where each particule of mass evolves in straight line. This interpretation corresponds to the Computational Fluid Dynamic (CFD) formulation proposed by Brenier and Benamou in . These solutions are time curves in the space of densities and geodesics for the Wasserstein distance. The CFD formulation relaxes the non-linear mass conservation constraint into a time dependent continuity equation, the cost function remains convex but is highly non smooth. A remarkable feature of this dynamical formulation is that it can be re-cast as a convex but non smooth optimization problem. This convex dynamical formulation finds many non-trivial extensions and applications, see for instance . The CFD formulation also appears to be a limit case of Mean Fields games (MFGs), a large class of economic models introduced by Lasry and Lions  leading to a system coupling an Hamilton-Jacobi with a Fokker-Planck equation. In contrast, the Monge case where the ground cost is the euclidan distance leads to a static system of PDEs . Figure 2. 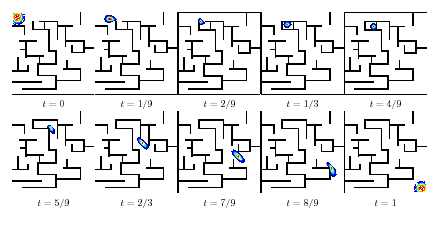 Examples of displacement interpolation (geodesic for optimal transport) according to a non-Euclidean Riemannian metric (the mass is constrained to move inside a maze) between to input Gaussian distributions. Note that the maze is dynamic: its topology change over time, the mass being “trapped” at time t=1/3. Gradient Flows for the Wasserstein Distance. Another extension is, instead of considering geodesic for transportation metric (i.e. minimizing the Wasserstein distance to a target measure), to make the density evolve in order to minimize some functional. Computing the steepest descent direction with respect to the Wasserstein distance defines a so-called Wasserstein gradient flow, also known as JKO gradient flows after its authors . This is a popular tool to study a large class of non-linear diffusion equations. Two interesting examples are the Keller-Segel system for chemotaxis ,  and a model of congested crowd motion proposed by Maury, Santambrogio and Roudneff-Chupin . From the numerical point of view, these schemes are understood to be the natural analogue of implicit scheme for linear parabolic equations. The resolution is however costly as in involves taking the derivative in the Wasserstein sense of the relevant energy, which in turns requires the resolution of a large scale convex but non-smooth minimization. Geodesic on infinite dimensional Riemannian spaces. To tackle more complicated warping problems, such as those encountered in medical image analysis, one unfortunately has to drop the convexity of the functional involved to define the gradient flow. This gradient flow can either be understood as defining a geodesic on the (infinite dimensional) group of diffeomorphisms , or on a (infinite dimensional) space of curves or surfaces . The de-facto standard to define, analyze and compute these geodesics is the “Large Deformation Diffeomorphic Metric Mapping” (LDDMM) framework of Trouvé, Younes, Holm and co-authors , . While in the CFD formulation of optimal transport, the metric on infinitesimal deformations is just the L2 norm (measure according to the density being transported), in LDDMM, one needs to use a stronger regularizing metric, such as Sobolev-like norms or reproducing kernel Hilbert spaces (RKHS). This enables a control over the smoothness of the deformation which is crucial for many applications. The price to pay is the need to solve a non-convex optimization problem through geodesic shooting method , which requires to integrate backward and forward the geodesic ODE. The resulting strong Riemannian geodesic structure on spaces of diffeomorphisms or shapes is also pivotal to allow to perform statistical analysis on the tangent space, to define mean shapes and perform dimensionality reduction when analyzing large collection of input shapes (e.g. to study evolution of a diseases in time or the variation across patients) .